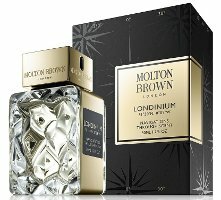 Molton Brown has launched Londinium, a new limited edition unisex fragrance. Londinium is part of the Navigations Through Scent series that debuted in 2011. This eccentric limited edition fragrance from Molton Brown pays homage to the city of contradictions with a scent inspired by street style and royal parks, malt whiskey on ice and the flash of a coloured lining in a Savile Row suit. A capital blend. The notes feature bergamot, crisp berries, myrrh, green oak moss, incense and aged malt whisky. Molton Brown Londinium is available now at Harrods in the UK, in 50 ml, concentration unknown, or via the Molton Brown website ($140). It’s the same bottle they used for the first 5 in the series…maybe you’ll like one of those! But don’t know if they are hard to find. The original five are at the Saks Fifth Avenue in San Francisco. I know that does not help Lucasai. I like the bottles as well, but after sniffing all five, there wasn’t a single one I wanted or was interested in. Most awkward name since Womanity? I hate to say this, but my first glance of the bottle made me think it was a tumbler of scotch or vodka on the rocks, standing in front of a book. Maybe it’s time for me to go to bed….